Last week was more of the same as the Los Angeles Rams and New England Patriots remained on top of our NFL Super Bowl Odds Power Rankings. The Rams survived a tough test from the Broncos’ defense at Mile High and the Pats won a Sunday night shootout with first-year phenom Patrick Mahomes II of KC. This week’s rankings feature the return of some early intriguing teams and a bit of a shakeup in the top 10. So without further ado fellow NFL betting fans, lets take a look at who’s up and who’s down with odds from 888's sportsbook. As with every other team on our list, the Los Angeles Chargers are currently playing second fiddle to the crosstown Rams. The Chargers can’t be ignored any longer, however, as they’ve emerged over the past two weeks as a true contender in the AFC West. Old Reliable Phillip Rivers was solid in Weeks 5 and 6 throwing for 546 yards and four touchdowns in wins over the Raiders and Browns. The real star for the Bolts, however, has been Melvin Gordon. Gordon punished upstart Cleveland in Sunday’s 38-14 victory picking up 132 yards on the ground and three touchdowns, doubling his total number of rushing scores for the year. 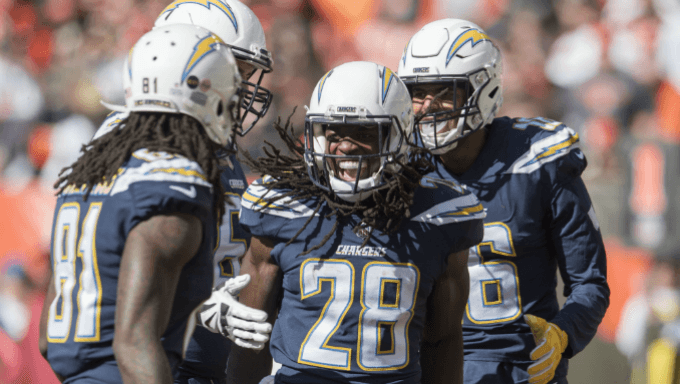 They may struggle to draw the eyes of LA fans, but the Chargers are definitely worth watching for bettors as they cracked the top 10 of our rankings this week. They’re one of the NFL’s more balanced teams so far ranking 13th in yards allowed per game and 7th in yards gained per game. 888sport has them at +1,800 to win the Super Bowl and that might be the best value they receive for the rest of the season. The last time we were this impressed with the New York Jets, they’d shocked the Detroit Lions 48-17 on Monday Night Football at the end of Week 1. Since then it’s been tough sledding as New York entered Week 5 at 1-3. Back-to-back wins over the Broncos (34-16) and Colts (42-34) have got Jets back to .500 and they’re worth taking another look at in the AFC East. The identity of this team is still up in the air, it appears. They’re good and experienced on defense while obviously young and mistake-prone with great upside offensively when Sam Darnold can get going. The rookie signal-caller from USC looked great in Weeks 5 and 6 throwing for 478 yards, five touchdowns and just two interceptions. The defense has been buzzing with five turnovers forced and five sacks, while kicker Jason Myers has become an unsung hero with nine (yes, nine) field goals made the last two games. Coming from near the bottom to the 21st spot in our rankings, the Jets are rolling again and they remain one of our more intriguing longshots to monitor. Their odds to win the Super Bowl remain daunting with Ladbrokes still giving them a 125/1 shot. This team will go as far as the defense and Darnold can take them, and a huge measuring stick game comes this week when Minnesota visits the Meadowlands.